Nifty stock live intraday bar reversal signal on technical charts. Identify stock trends for smart trading decisions with technical patterns, In terms of technical analysis Bar Reversal Pattern is the most widely used indicator by technical analyst for getting technical confirmation that the stock has ready to reverse it's current trend. Bar Reversal indicates a possible reversal of the current downtrend to a new uptrend or current uptrend to a new downtrend. This pattern is an indication of a underlying asset's Short Term outlook. A Strong Bullish Bar Reversal Pattern formed when today's low price of stock is lower than its previous day low price and today's current market price or close price is higher than its previous day's high price. A Strong Bearish Bar Reversal Pattern formed when today's high price is higher than its previous day high price and today's current price or close price is lower than its previous day low price. A Bullish Bar Reversal Pattern formed when today's low price is lower than its previous day low price and today's current market price or today's close price is higher than its previous day's close price. 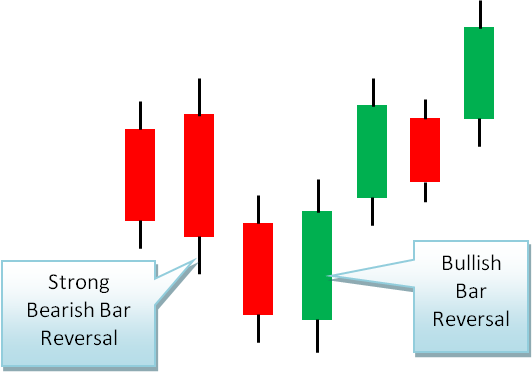 A Bearish Bar Reversal Pattern formed when today's high price of stock is higher than its previous day high price and the current market price or today's close is lower than its previous day's close price. You might also be interested in Daily Nifty-50 Stock Fibonacci Pivot Level It will help you to calculate the Retracement levels of the completed trend. super ji.very useful website .